It may well be apocryphal, but the exchange between Fitzgerald and Hemingway about the well heeled couldn't be more appropriate. "The rich are different than you and me," said the former, who got a quick retort from Papa: "Yes, they have more money." 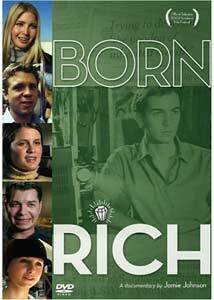 Born Rich is a look into a socioeconomic stratum rarely seen outside of the most posh boarding schools and the high-end shops on Madison Avenue�it's a documentary about those few in their late teens and early twenties who are close to wealthy beyond measure, who have inherited a huge amount of money; they're young people who will never have to work a day in their lives, and many of them never will. It's not a great portrait, by any measure, but just the fact that we get to ogle at them, like billionaire animals in a gilded zoo, for an hour, anyway, has its fascinations. Access to this world probably could only have been attained by a member of the club, so it's no surprise to learn that Jamie Johnson, the film's director, is an heir to the Johnson & Johnson fortune�Band-Aids and talcum powder have him and future generations of Johnsons in clover. Johnson is crazy rich, but I don�t know that he's much of a filmmaker; just the fact that some of these people would talk to him, though, make it worth a look. (Whit Stillman's are probably the closest narrative films to this world, but even those characters would probably need to add more than a couple of zeroes to their bank accounts to be in this league.) Johnson's world is a decidedly Manhattan-centric one, despite the fact that he grew up in New Jersey; he and his comrades now all seem to live in New York, in various stages of unhappiness, guilt, indulgence and denial. If you had all the money in the world, would you spend your time fencing? S.I. Newhouse IV, heir to the Cond� Nast publishing fortune, would and does; he seems the most uncomfortable in his own skin, with obvious issues with his parents, and seems most at home not in New York, but in his dorm at Haverford. Or perhaps you'd ride? That�s the path taken by Georgina Bloomberg, daughter of the mayor of New York and a billionaire media magnate. Some familiar names are here, most notably Ivanka Trump; the stories of all of these young people come to have a sameness to them, and the parlor game you may want to play is: Who's the most loathsome? It's hard to lose a competition like this when you say things like "I'm a German baron and an Italian viscount," but my winner, hands down, is Cody Franchetti, a textile heir who has never been wrong about anything ever. Just ask him. He especially seems to think he's better because he's rich; he isn't, and the question you may start to ask is: is he worse? Image Transfer Review: It's all pretty fuzzy, with the unintended irony being that this movie about the super-wealthy looks like a pretty low-rent affair. The transfer itself is adequate, with some muddy but consistent colors. A package (14m:15s) of five deleted scenes offers more of the same, including S.I. giving us a tour chez Newhouse, lots and lots of alcohol, and a fleshy drunkard named Gavin, who no doubt will be played by Philip Seymour Hoffman (in Freddie Miles mode) in the remake. An uneven look at the youngest members of President Bush's base, Born Rich is a movie that could only have been made by a member of its exclusive club, and if it isn't filmmaking of the highest order, it will show you a world that the rest of us can only imagine.